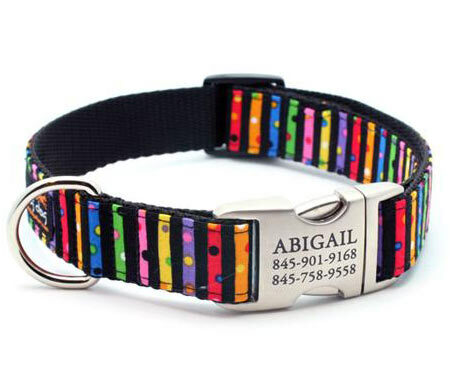 Dots and Stripes Dog Collar with Custom Engraved Buckle. Matching Leash available. 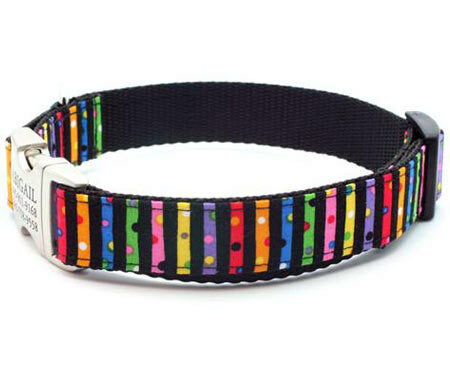 The Lorelei collar features a rainbow palette of stripes with dots scattered around. Securely sewn to industrial strength black nylon webbing. Beautiful and strong streamlined solid cast side release aluminum buckle in a stylish satin finish. Corrosion proof buckles will not crack in freezing weather climates. Matching leashes available in 4 ft, 5 ft or 6 ft lengths. Personalized with up to 4 lines laser engraved text on the buckle with a maximum of 15 characters per line (4th line of engraving not available on 5/8" or 3/4" collars). Custom engraved with the text and the font you choose! The matching leads feature the same fashionable designs applied to heavyweight nylon webbing and are are available in 4 ft, 5 ft or 6 ft lengths. The leashes also include a d-ring at the handle for hanging keys or poopbag. Please measure your dog's neck size carefully. This dog collar is custom made to order and is not eligible for return/exchange. Please allow up to 2 weeks for delivery. for tiny and extra small dogs, for puppies, for toy dogs, for puppy dogs, for small dogs, for medium dogs, for big dogs, and for giant dogs, extra large dog breeds...! 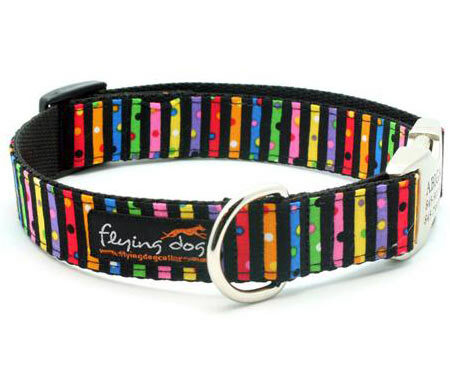 Buy online in the dog collar store: flying dog collars, designer dog collars, ribbon and nylon dog collars, handmade designer dog collar & leash sets from Flying Dog Collars; Hand Made in the USA. 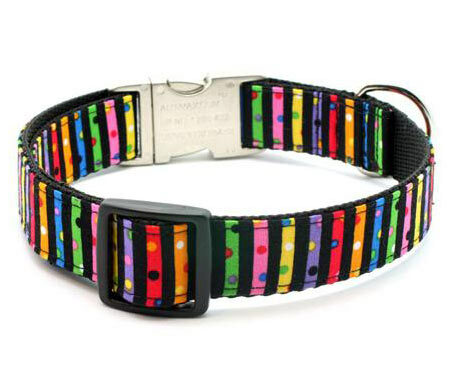 Handmade Striped Designer Dog Collars personalized with custom engraved buckle for your dog's name and other ID text. The Lorelei, bright colored dots and stripes ribbon on nylon, playful and cute. Designer Dog Collar personalized with custom engraved buckle for your dog's name and other ID text. From Extra Small 8 inch, up to Extra Large up to 28 inch neck. Leash available. For tiny dog breeds, extra small dogs and small puppies, small, medium, large and extra large dogs, up to neck size 28 inches! Custom engraved to your likings, beautiful, strong and lightweight cast aluminium side release buckle. Only the finest heavy guage welded steel nickel plated dee rings. Premium nylon webbing with up to 6,000 lb. tensile strength... made in the USA. Handmade 100% cotton designer fabric ribbon overlay securely stitched with strong nylon thread. Designer dog collars and leads, personalized dog collars and leashes. Collar and Leash Set. XS Extra Small collars for dogs, for puppy dogs, tiny puppies; Small dog collar (S, XS), Medium dog collar (M), large dog collar (L), extra large dog collar (xl, xxl). Available Neck Sizes in inches: 8 inch, 9 inch, 10 inch, 11 inch, 12 inch, 13 inch, 14 inch, 15 inch, 16 inch, 17 inch, 18 inch, 19 inch, 20 inch, 21 inch, 22 inch, 23 inch, 24 inch, 25 inch, 26 inch, 27 inch, and 28 inch.